What are Fuel Cell Forklifts? With minimal emissions and environmentally friendly performance, fuel cell forklifts are similar to electric-powered forklifts. And unlike traditional internal combustion engine (ICE) forklifts, fuel cell forklifts can operate much longer without refueling. But what makes fuel cell forklifts so interesting? And why do some analysts think they’re the “next big thing” in the forklift industry? There are many reasons, but let’s look at some news stories to see what’s actually happening with fuel cells and forklifts. One reason is potential growth. While some industry experts think fuel cell technology is still a long way from being a reliable source of energy, others think the benefits are too great to ignore. That just one reason Wal-Mart recently ordered 1,700 fuel cell forklifts for six different North American distribution centers. A Wal-Mart spokesperson thinks his workers will spend less time refueling and more time actually working – and that’s always good for a company’s bottom line. 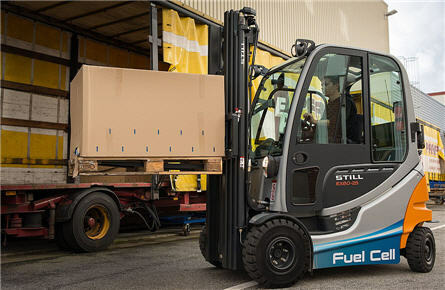 Fuel cell forklifts – such as the hydrogen lifts ordered by Wal-Mart – use a basic chemical reaction to turn hydrogen (and other gas) into electricity. The advantages of this type of energy is that is doesn’t use gas or oil. The technology is also gaining interest in Europe, where fuel cell forklifts are being tested to confirm that a single lift working just 16 hours can offset carbon (CO2) emissions equal to that of eight gasoline powered cars. Pretty impressive stuff! As you can see, forklift technology never stands still. And neither does Certifyme.net. We’ve helped thousands of forklift drivers all over the United States with their training needs. It doesn’t matter if you drive the old-style forklifts or the fancy new fuel cell lifts – we’re experienced enough to assist anyone. If you or your company needs to become or remain OSHA compliant, we’re the top option for forklift training courses. We have many famous companies on our client list. Just some include Penske, Jenny Craig, Coca-Cola, Harley-Davidson, Siemens and more. If you’d like to see how we can help your company, call us at (888) 699-4800. We also have an informative contact page with other ways to reach us. Thank you for visiting our website and reading the CertifyMe.net blog.